The site for the capital of the newly-federated Commonwealth of Australia was selected in 1908 and the land surrounding it was constituted as the Australian Capital Territory in 1910. An international competition that attracted 137 entries for the design of the new city was won in 1911 by Walter Burley Griffin, a landscape architect from Chicago. Construction work on the new city started in 1913, but development was slow until the mid-1950s, and the central Burley Griffin Lake was not damned and filled until 1963. The first Parliament House was built in 1927, designed by JS Murdoch, a Scottish migrant who was architect of many of Canberra’s early landmark buildings. The first substantial permanent house in the city was also designed by Murdoch and built in the district called Acton in 1913 for Col. David Miller, the administrator of the Capital Territory. 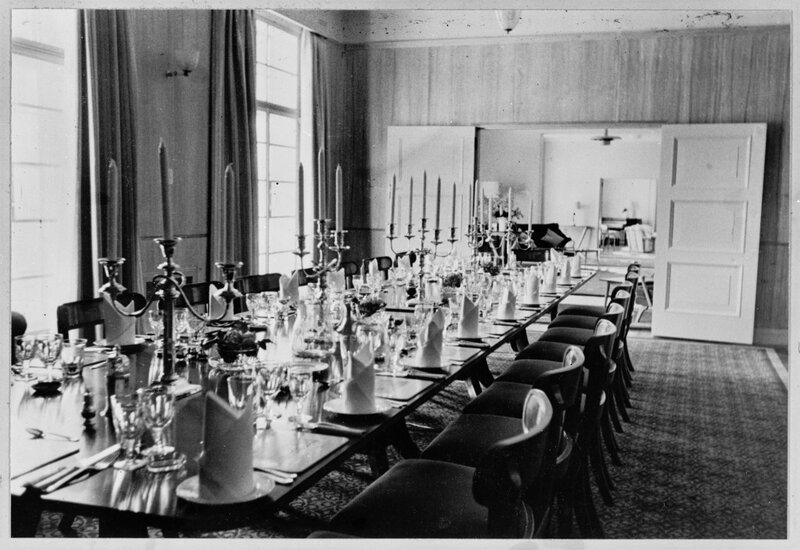 Called The Residency, the house was intermittently the base for the succession of administrators, committees and chairmen who wrestled with the development of Canberra through thin times. In the mid-1920s, it was re-named Canberra House but was not continuously occupied. 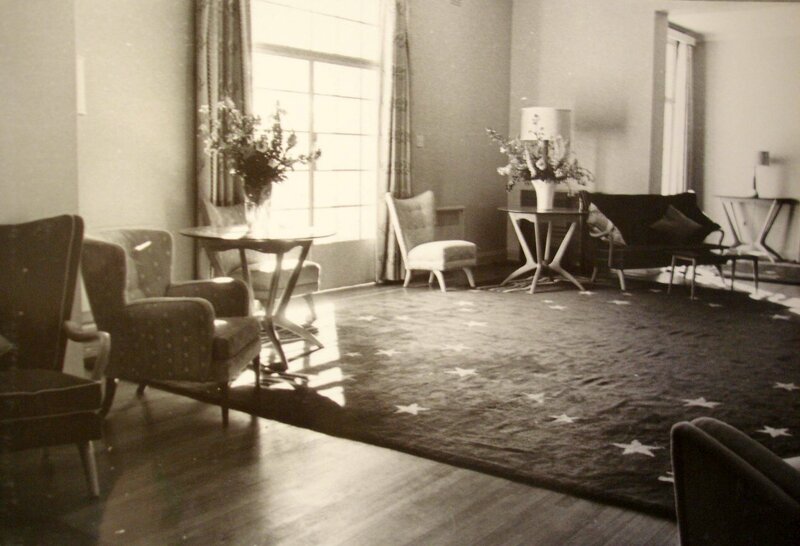 When Ernest Crutchley, the British government representative for migration in Melbourne, moved to Canberra in 1931 to establish the high commission there, he had no difficulty in renting Canberra House for his residence. He also found office space in East Block, close to the then Parliament House. For financial reasons, however, the Treasury delayed appointing the first high commissioner and it was not until 1936 that Sir Geoffrey Whiskard arrived in Canberra in the role. He moved straight into Canberra House, which had been enlarged somewhat in the months since Crutchley had vacated it. 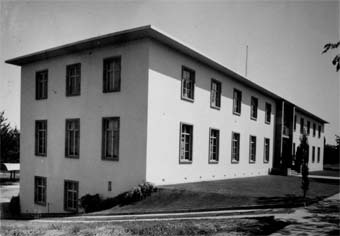 By the end of the Second World War, it was clear that both the offices and the residence would have to move: the offices, then on the first floor of the Patents Office building, were much too small; and the owner of Canberra House, by then the Australian National University, wanted it back. Negotiations for two new sites therefore began in 1948. Their final selection was made during a visit by Douglas Alexander, a senior architect in the Ministry of Works, in early 1949. Alexander also selected the practice of E.A. & T.M. Scott of Dalton House, Pitt Street, Sydney, as architects for the buildings on both sites. The Treasury approved the sites, which were to be taken on 99-year Crown leases, and the expenditure of about £40,000 on each of the two new buildings, in September 1950. Both started on site in August 1951 with the same contractor, Welch Bros. of Canberra. The out-turn cost for the offices was £103,000 and for the residence £107,000. The Ministry of Works clerk of works was Marr. The site for the offices, just over 0.8 hectare, was at Yarralumla Section 43, within the area designated for diplomatic buildings on Commonwealth Avenue, the main roadway between Capital Hill to the south and the commercial centre to the north. Scott, the architect, completed here in 1952 a two storey rectangular block facing Commonwealth Avenue, with the fall of the site permitting three storeys at the rear. He made provision for a later rearwards extension, at right angles to the avenue, to house the Service Attachés who were expected eventually to be transferred from Melbourne. This extension was built in 1960. In that year, also, the first lease on the site was converted to a 90 year Crown lease to make it co-terminous with the residence site lease. 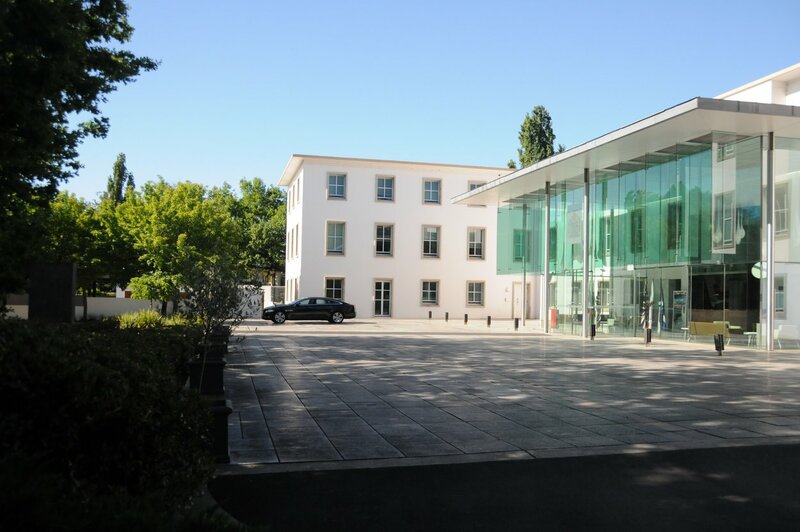 Apart from the conversion of the lower ground floor of the 1952 block from garaging and storage to office use, the offices building underwent no significant change until a major refurbishment programme in the mid-1990s. The staff decanted into rented offices in the nearby Old Parliament Annex for the duration. The programme included moving the main entrance from the Commonwealth Avenue side of the building to a large new atrium built at the rear. The architects were Mitchell/Giurgola & Thorp, and the project managers were Integrated Construction Management Services. 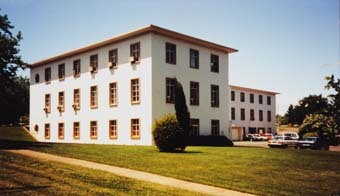 The renovated building was opened jointly by Prime Minister John Howard and high commissioner Sir Roger Carrick on 5 February 1997. At this time, also, a porphyry sculpture was commissioned from Stephen Cox and installed in the garden ‘In tribute to shared sacrifices of British and Australian men and women in the defence of freedom’. The site selected in 1949 for the residence, of rather over 1.8 hectares, was in Deakin, then one of the highest residential areas in Canberra and just outside the designated diplomatic area. The Crown lease was for 99 years from July 1951. The intention was to build residences for both the high commissioner and his deputy on the site but a gardener’s cottage soon superseded a house for the deputy, who went on living at 42 National Circuit, Forrest, which had been leased since 1926. The Ministry of Works, doubtless to avoid any risk of another over-the-top residence like the one recently completed at Rio de Janeiro, excluded the outline design of the Canberra residence from its architectural commission to Scott. The design, the first for a residence after the Second World War, was entrusted to Alexander, who proposed a long, thin, low-key, two-storey building along the top of the ridge. 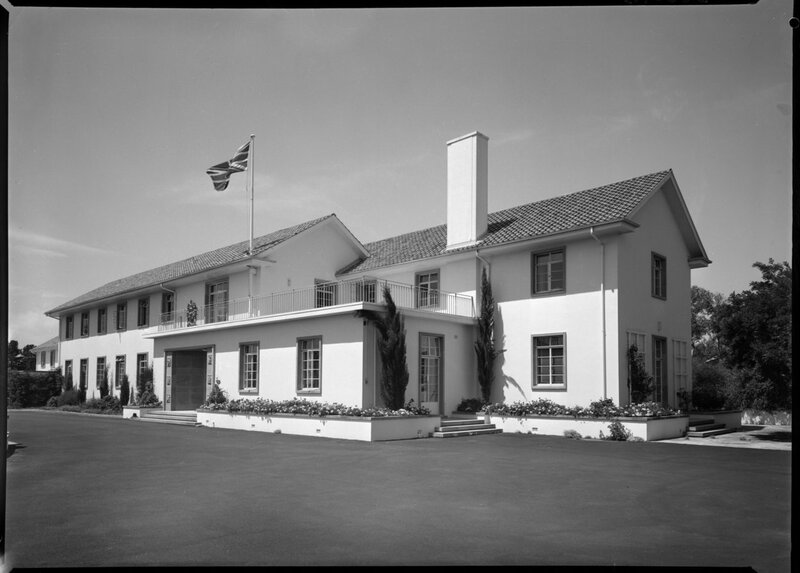 The high commissioner, Sir Stephen Holmes, moved into the new residence, again named Canberra House, on 24 October 1953. The building was widely criticised at first for being too modest, poorly furnished and insufficiently served by staff quarters, but it had a sensible plan and has stood the test of time. There has been just one structural alteration to the house: a small private sitting room was built over the front door, taking in part of the very large balcony, during the early 1970s. Over the early years, Britain’s appropriation of the name Canberra House was increasingly resented: why should a national name remain with a member of the European Common Market. When a new office block in Canberra was named Canberra House in 1975, the then High Commissioner, Sir Morrice James, quietly changed the name of his residence to Westminster House. The Canberra House, in Acton, that high commissioners vacated in 1953, was immediately renamed Old Canberra House, which it remains. The university let it to the Commonwealth Club from 1956 to 1965, after which it became the university’s staff centre until 1987, and part of University House until 1999. It is now home to the university’s Research School of Humanities. 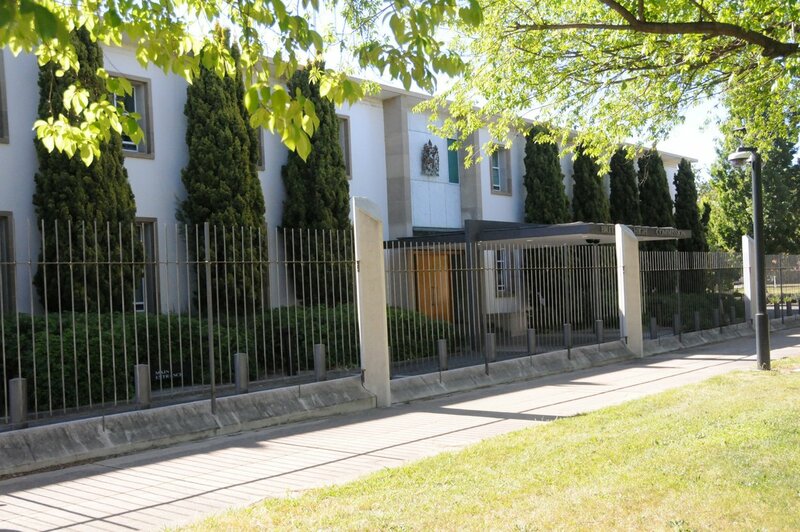 The high commission in Canberra has always had a large number of staff houses and other units on 99 year leases: around 30 in the 1990s, quite a few of them inherited from other Government Departments. 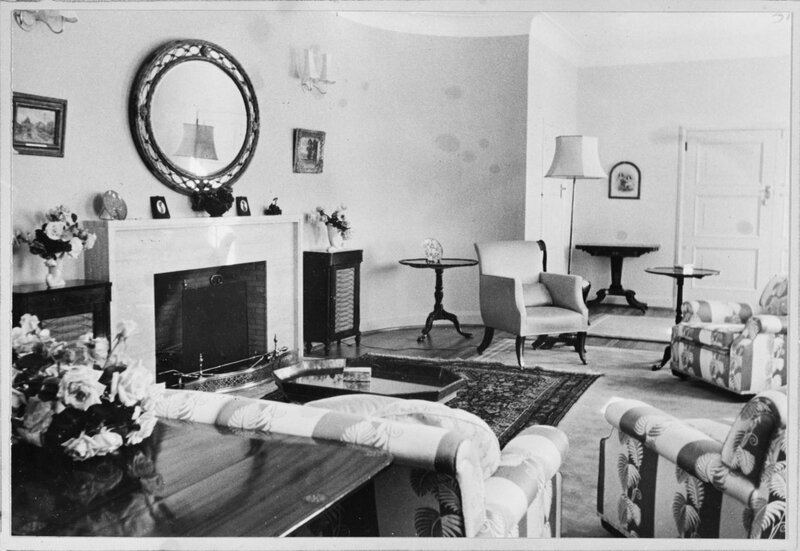 Most of the houses were much liked for family life, not least because of the short drive to work: 8 Wilmot Crescent and 42 National Circuit, leased since the 1920s; a few were built by MPBW – 1 and 5 Ord Street and 59 National Circuit, in the 1950s, and 14 Talbot Street in the 1960s; and other addresses, like 4 Somers Crescent, 19 Mugga Way, and 33 State Circle – resonate with their former occupants. 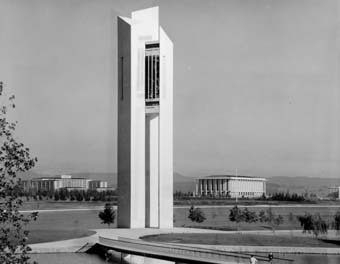 It was announced in Canberra in March 1963, in the presence of HM The Queen and on the 50th anniversary of the start of building the city, that the British Government would offer, as a gift, a significant contribution to the development of Canberra to reflect the common Parliamentary heritage of the two countries. Four years later, it was decided that the gift should take the form of a carillon and belltower, to be erected on Aspen Island in Lake Burley Griffin. The Ministry of Public Building and Works organised a limited design competition between six architects, three recommended by each of the two Royal Institutes of Architecture. The competition was won by Cameron, Chisholm and Nicol of Perth, Australia. The National Capital Development Commission built the foundations for the belltower and the access bridge to Aspen Island; Dillingham Constructions Pty Ltd built the 160ft high tower, under the supervision of an MPBW clerk of works, Geoff Toomer; MPBW’s Supplies Division managed the manufacture of the 53-bell carillon; and John Taylor & Co of Loughborough cast the bells in bronze. HM The Queen opened the National Carillon on 26 April 1970. Carillon, completed 1970 on Aspen Island. 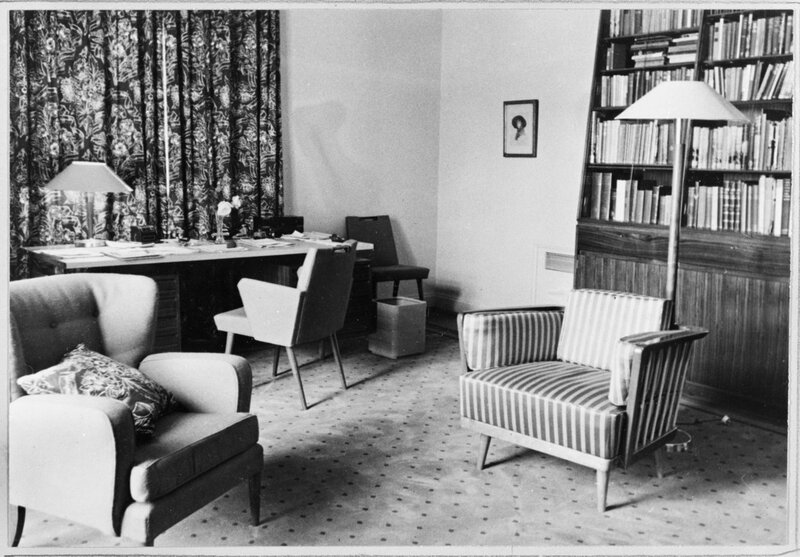 Barder, Jane, Canberra House – Westminster House 1931–1993, unpublished FCO typescript, May 1993. Entrance front of offices, completed 1952. End of new offices building, designed to take an extension if later required, 1952. Rear wing for Service Attaches, completed 1960. Frontage to Commonwealth Avenue, 2013. 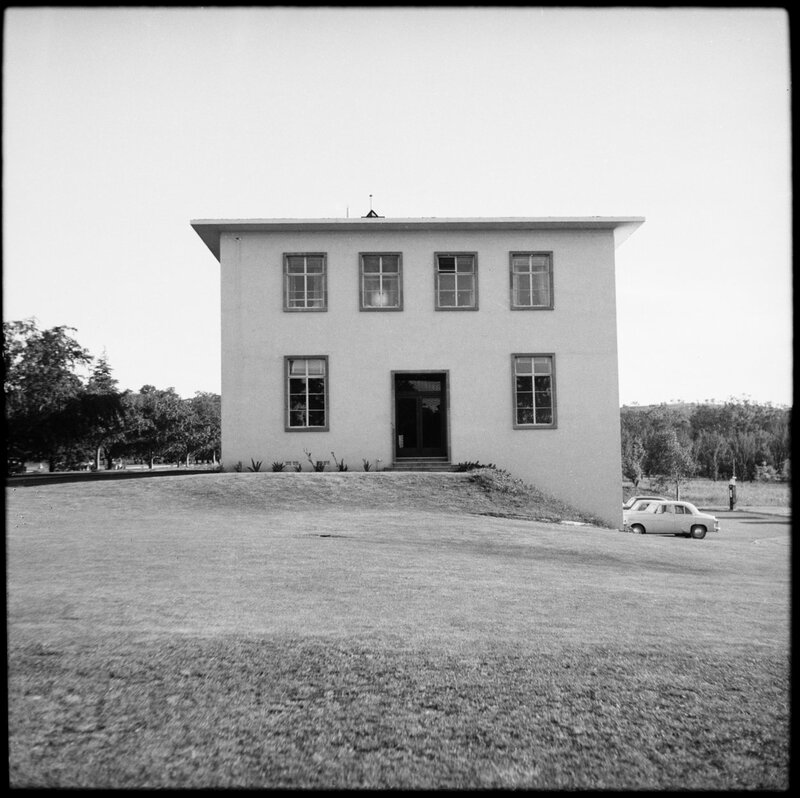 Entrance front of residence, 1965. 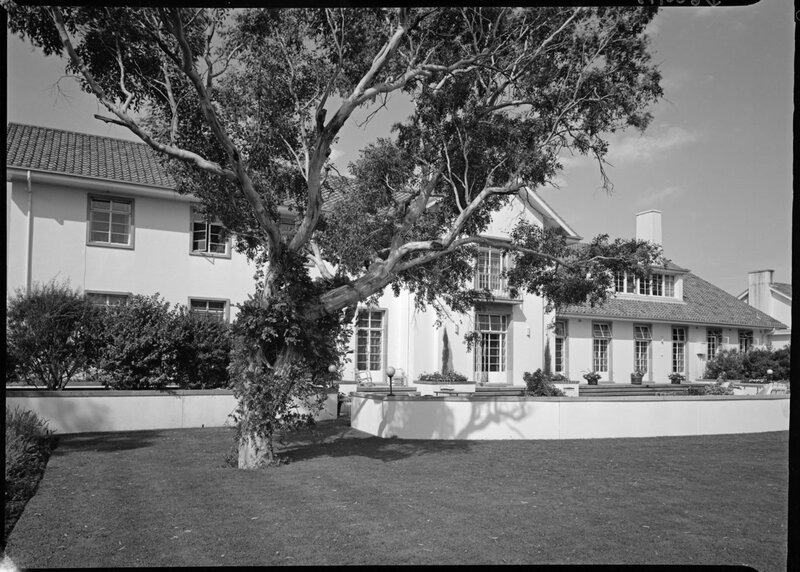 Garden front of residence, 1965. 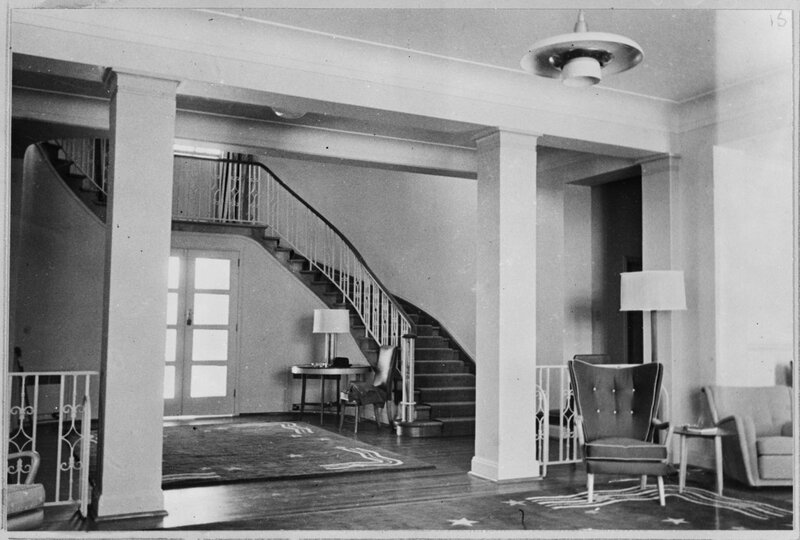 Entrance hall and stair, 1964. 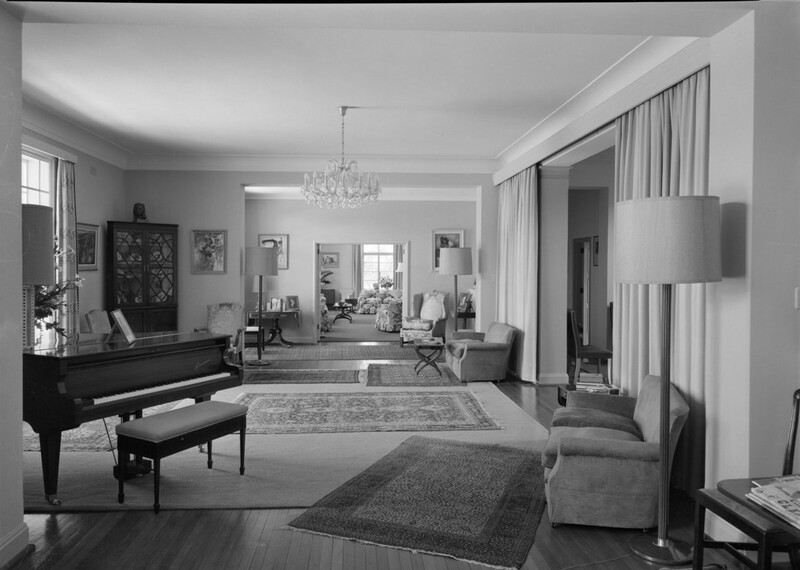 Reception area, looking towards drawing room, 1965.